This topic will cover all information on the election process from the caucus in March to the primaries in June to the election in November, and all of the candidates running. We will have separate topics for individual races for Park County Sheriff, Park County Commissioner, and others to be added in which to discuss issues and candidates specific to those races in order to help keep things organized. Please feel free to ask questions, add your thoughts and any information you have. Please keep in mind that this is our Courthouse Forum where we debate the issue and keep it respectful and civil. Personal attacks, insults, etc will be moved to The Ring where you may engage there. Our goal is to help inform and encourage you all to get involved in the elections! We strongly feel that an informed and active community makes the best decisions for future development, safety, and services for those who live and work here. Thank you for your input! 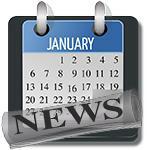 Feb 5: Last day to update your voter registration address to participate in the March 6th party precinct caucuses. (Must be a resident of the precinct for 30 days and registered to vote no later than 29 days before the precinct caucus). April 6: Last day to submit draft ballot issues to the Title Board, if the issue is to appear on the 2018 General Election ballot. You also have the option if you are a first-time voter, inactive voter, or have had a change of address, affiliation, etc. to complete this form (PDF) and either mail to P.O. Box 220, Fairplay, CO 80440 or drop off at the Fairplay Office at 501 Main Street or the Bailey Office at 59865 Highway 285. List of candidates for each position as listed on Tracer. We will update as changes are made. 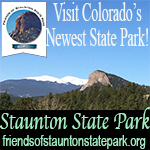 Louise Peterson and I will be conducting a FREE workshop on the Colorado political process. Who: Everyone is welcome to attend and participate in the workshop. We especially extend an a warm invitation to young people who are interested in learning how we choose our leaders for public office. What: “Introduction to 2018 Colorado Political Process” workshop. Where: Guffey Firehouse #1 located at 1745 County Road 102 in Guffey, CO.
For those who don’t know me, I have been a Republican Precinct Leader, County Delegate, State Delegate and Special District Delegate. In 2011, Lani Gosset and I conducted a similar workshop. 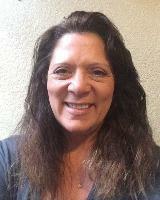 I am running for the Park County Assessor and though a number of the questions for the 2018 Candidates do not pertain to the Assessor's Office, I wanted to answer the questions that did. I am in the process of setting up my web page and other posting and will update the information as I get things done. Thank you Ms. Jones, we appreciate you taking the time to answer them, and post them here! In my work with youth and families throughout Colorado’s rural regions, I have experienced many systemic issues that are creating barriers in our communities’ capacity to thrive. 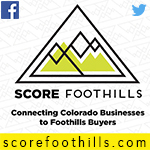 Housing insecurities, water, food sacristy, transportation, infrastructure, employment opportunities, and funding shortages are all significant issues that impact Park County residents at every level. I believe that we need a new generation of leadership to bring forward collaborative problem solving and creative solutions. 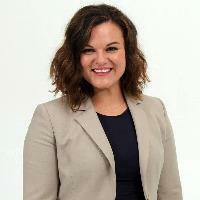 I want to use my leadership experience, heart for service, and mind for strategy to help shape the future of Park County. A place where we can all live, grow, and thrive. Thank you for also joining us here at My Mountain Town April Dawn Knudsen! We appreciate you taking the time to reach out to residents here, and hope to hear more in the future from you. Please do share any meet n greets or other news anytime. 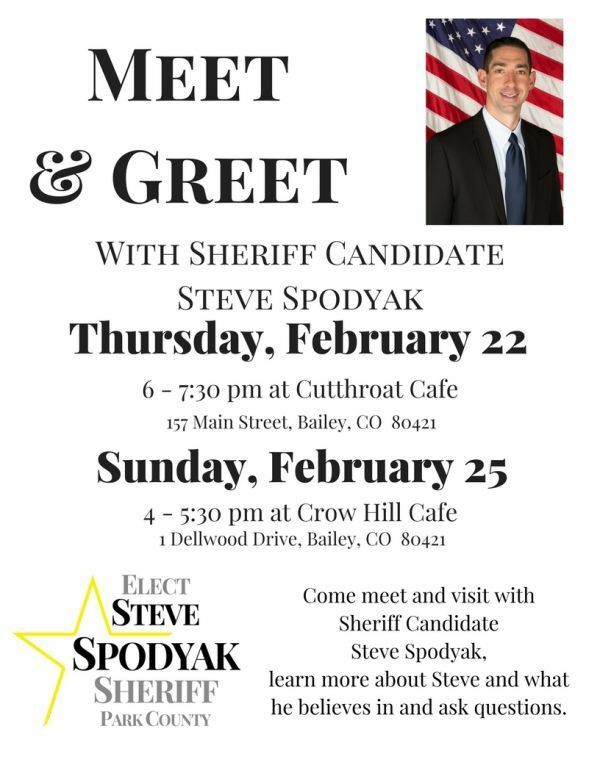 Two opportunities in Bailey this week to come meet and visit with Sheriff Candidate Steve Spodyak! Learn more about Steve and what he believes in and ask questions. Visit http://stevespodyakforsheriff.com/upcoming-events/ for details on all upcoming events. Stop in to either event to pick up your yard signs! Looking forward to seeing everyone! Thank you to Chip at The Cutthroat Cafe and Jeff at Crow Hill Cafe for generously opening up their businesses for these events!